Used in refrigeration system pipeline with bi-flow or unidirectional flow to absorb moisture and h acid in the system and filter out impurities. 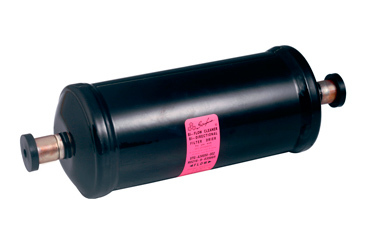 Solid filter cores are bound with desiccant which can minimize vibration and friction in system operation. And it also reduces the wear of desiccant. Corrosion resistant painting can survive salt spray test of 500 hours. Applicable medium temperature: -30°C ~ 120°C (-22°F ~ +240°F? Applicable ambient temperature: -30°C ~ 55°C (-22°F ~ +131°F? 1) For CFC system, usage of core with alumina is recommended as a strong capability to absorb acid may be needed. 2) When the systems use oil with additive, it is not recommended to use a core with alumina. Note: The products listed are standard products which can also be customized. 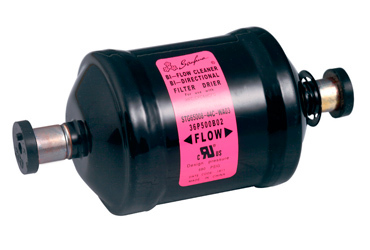 Note: The above data is based on cleaning system of ideal condition; after impurities accumulate in the filter, the flow will decrease.